I met up with my good friend, Ryan (from the blog O No Another Orioles Blog), and caught two Bowie Baysox games in Richmond this past weekend. The highlight of the trip was that we were able to watch Nolan Reimold play for Bowie in the final two games of his rehab assignment. Bowie took Saturday's game, 3-0 behind a stellar pitching performance by Tyler Wilson. Wilson went 7 innings, allowing only 2 hits, one walk and striking out 9. He was awesome. The win put Wilson at 10-5 on the year with a 3.72 ERA. He was aided by Nolan who went 2-4 with a SB, Christian Walker who went 3-4 and Dariel Alvarez who went 2-4. Walker and Alvarez appear to be legit prospects and should be in Baltimore very soon. After the game, Ryan and I met Nolan as he was exiting the stadium. I'm sure I came off a little Kathy Bates-like (I'm your number one fan) when I talked to Nolan. I couldn't help it. I got nervous and ended up running off at the mouth. I hope Nolan understood that I was just excited and didn't want to come off looking like some crazed fan. The second game wasn't as eventful as the first. The Baysox lost 4-3 with Nolan going 0 for 4, lowering his AA average to .314. Walker and Alvarez each went 0-4 as well. The game was further marred by a dud of an outing by Orioles pitching prospect, Eduardo Rodriguez. I'm sure folks have seen him throw better, but Ryan and I picked a bad time to watch him as he lasted only 3.2 innings, allowing 4 runs (3 earned) with 4 walks and 3 strikeouts. Rodriguez looked like a typical Baltimore pitcher, throwing a ton of pitches early and walking a lot of guys. I don't know what it is, but the Orioles need to work on better pitching development and finding guys who don't walk a ton of batters. Before Saturday's game, I got autographs from Dariel Alvarez (above). Can anyone help me with his inscription? I can't make heads or tails of it. Below is a signed ball by Christian Walker. I had only one OMLB ball, which I got Alvarez with and I had a ton of synthetic cover balls that I needed to find a use for, so the Walker ball ends up being a bit of an experiment as well. I used Ryan's Staedtler pen on both balls. Let's see if this pen, which I have heard rave reviews of, can hold a signature on these synthetic leather balls. If they work, I may have a use for these balls yet (and I will need to buy my own pen). Finally, I treat you all with an amateur video I shot of one of Nolan's hits from Saturday's game. I hope you enjoy. I had a really good time at the game with Ryan, who I hadn't seen in over a year (wow). I didn't mind the concrete monstrosity that was "The Diamond" (the RIchmond field). It was very easy for us to get autographs, as we could stand by the wall right by the field, reminiscent of Kinston's Grainger Stadium. The experience was fine and the hot dogs were really good. The aesthetics of the park get a -1 out of 10, but other than that, I have no complaints whatsoever, so I would have to rate my overall experience as very high. I miss being able to catch minor league games, so I think I need to go out and catch some more like I had been back in 2010 and 2011. We'll see how that goes. I apologize for not posting yesterday, but I was at a MiLB game with my good friend, Ryan. I got home today and had too much to do to be able to post my recap, so look for that tomorrow. 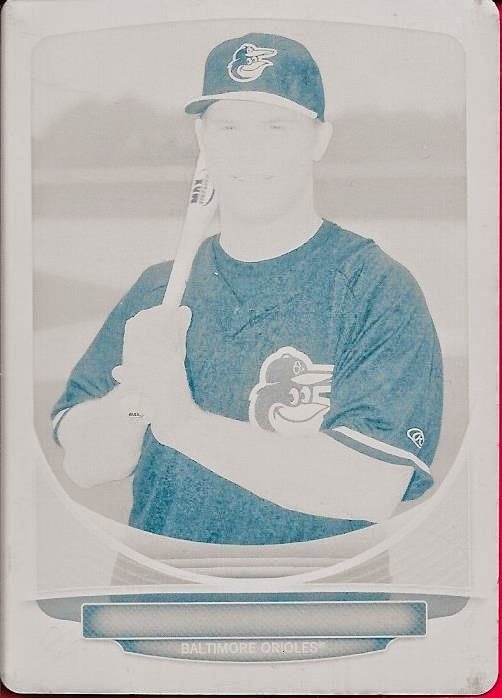 In the meantime, take a look at this 2013 Bowman Alex Murphy printing plate. I got this plate off of Ebay for $9.99 BIN, which was a steal! Murphy is doing pretty well at Low A Aberdeen, even though the team isn't playing well at all right now. So far, this season, Murphy has played 16 games in Aberdeen and 4 at Delmarva. In all, he is batting .274 with 2 homers and 7 RBIs. Not terrible, but he needs to pick it up some more. I think he'll be fine, since this is his first full MiLB season. 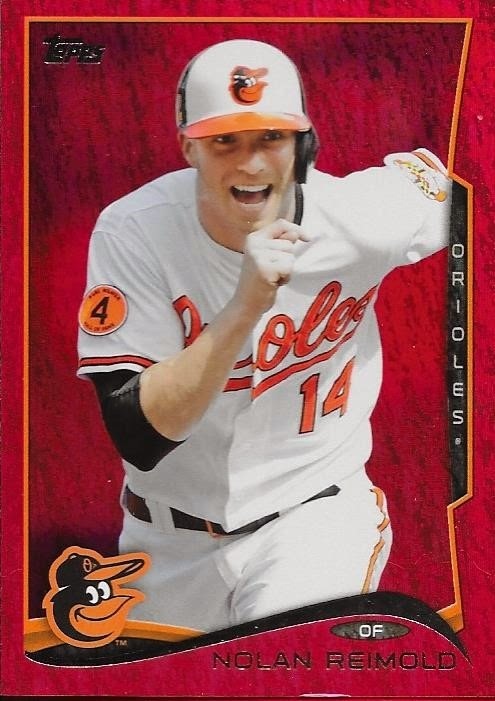 I got a nice surprise package from my good friend, Scott, the other day that had several Orioles cards in it. Scott said that he had found them laying around in his room and he wanted me to have them. I really appreciated the gesture, especially since it has been since Fan Fest that I have seen him. Scott just recently graduated High School and is set to attend JMU in the fall. I'm really happy for him. I'm a little disappointed that my graduation gift to him, which was supposed to ship on June 21 has not arrived yet, but I'm holding out hope that it will get here soon! Thanks so much for the cards, Scott! Another Instagram Trade With Max S.
A few weeks ago, I completed another deal with a guy, Max, that I met on Instagram. 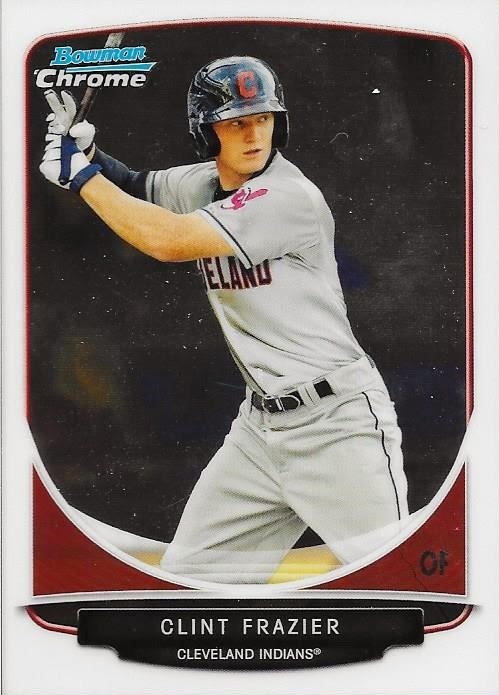 I sent him some more Cubs cards and in return, he sent me this 2013 Bowman Chrome Clint Frazier and a few vintage cards. I was happy to get a chrome Frazier, since I didn't have much of him. He's a pretty good prospect and it's nice to grab a few here and there before they reach the majors. I don't do much prospecting at all, but in this case, I was happy to get the card. 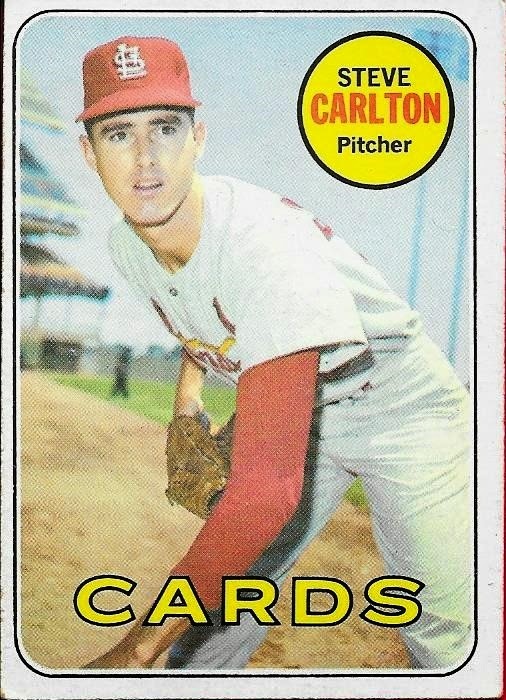 The highlight of the vintage cards was this 1969 Topps world series highlight card. I already had it in my set, but I will be adding it to my HOF box. It is a nice looking card. 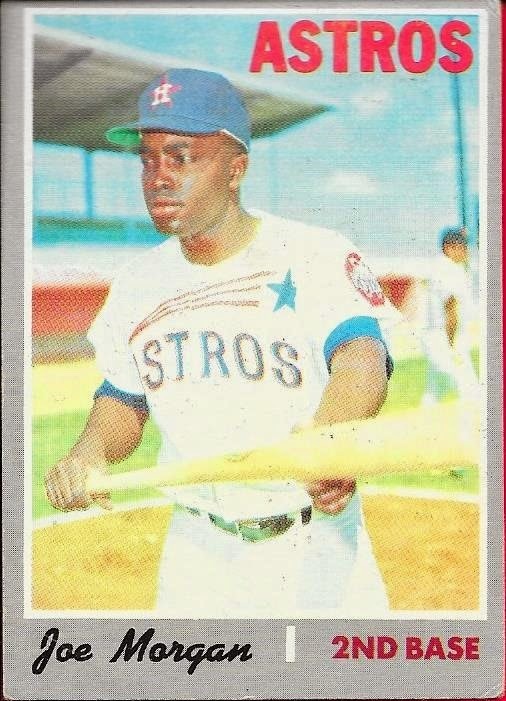 Max also included a 1976 Topps Brock, and a few other non-stars. Thanks for the trade, Max, I really appreciate it! After Series 2 came out, I jumped on Ebay to see what parallels I could find right away so I didn't miss any (unlike times past). Immediately, I noticed the orange parallel of Nolan Reimold was available for bid. I'm not quite sure what the orange parallels tie into this year. Are they part of the factory sets? Those were numbered in the past, this one is not. Can anyone help me on this? The card looks great, though, and I'm happy to have it in my collection. Gold always looks good for Topps, and this one is no exception. This card is numbered 1068/2014. I spent $0.99 on it, while the orange was a lot more. Finally, I added the Red Hot foil parallel. Much like last year's Emerald parallels, you have these red foils. They look fine, too. I wonder what color they will use next year...?? Anyway, I was glad to add these three Nolan parallels to my PC. I'm glad he was included in Series 2. Hopefully, he will be on the O's roster soon. Here is another Ebay pickup that I got recently. 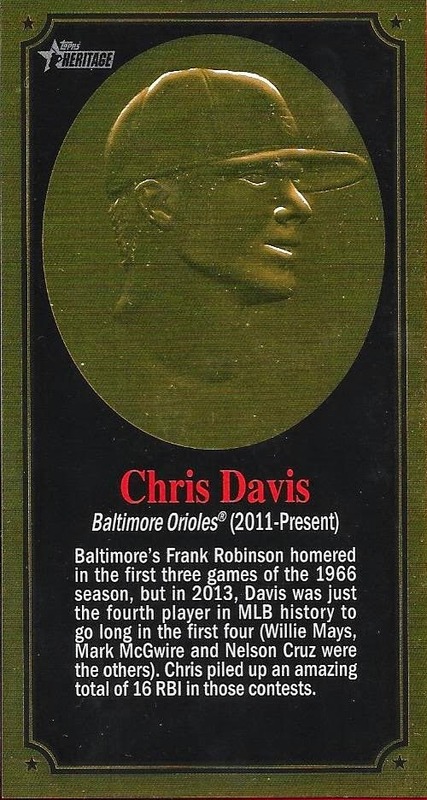 Topps rolled out the old embossed design from 1965 in conjunction with this year's Heritage offering. These are similar to the 1965 Embossed, except larger and have writing on them. I think they look pretty cool, though and have always liked the originals. I busted one box of 2014 Heritage and didn't get one of these. I got one of the crappy advertising panels, which I promptly sold. I don't care for those at all. I wish I had gotten one of these, instead. Anyway, Ebay helped me out on both ends and I'm happy. I got quite a few parallels and inserts of some of my favorite Orioles players off of Ebay recently. 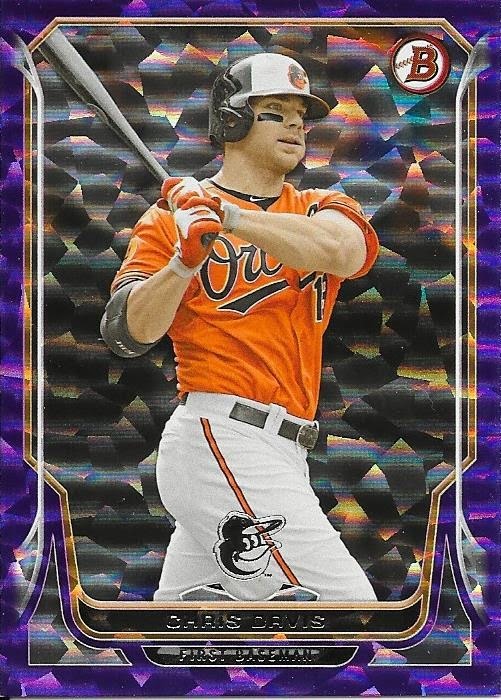 This Purple Ice Chris Davis is really awesome and I was able to bring it home for $21. The card is numbered 10/10 (EBAY ONE OF ONE!!!! OH EMM GEE). I really like these Ice parallels and will try to get a few more Davis cards, if I can. I doubt I will go for the entire rainbow, but we'll see. If I can find a 1/1 at a reasonable price, then I may just go for it. I have yet to complete a rainbow of any recent player, thanks to the 1/1 Platinum parallels. One of these days a Davis or Reimold platinum will fall into my lap. I can dream, right? With a tough act to follow from last night's posts, I present a brief one tonight. 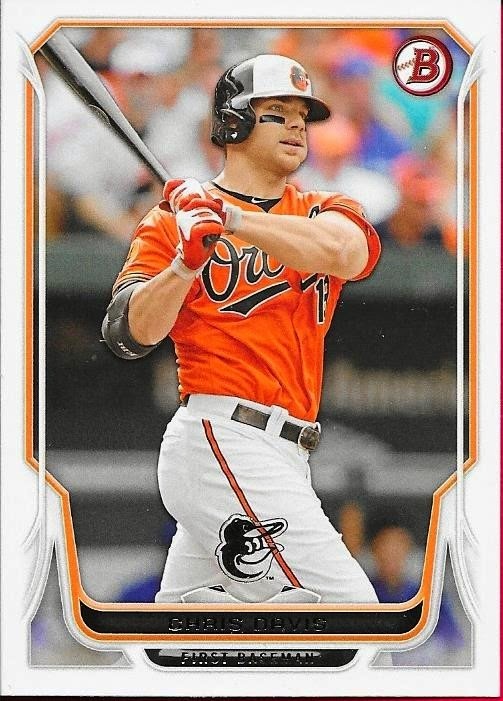 I got this 2014 Topps Series 2 Silk Collection Chris Davis off of Ebay the other day and it came in the mail yesterday. Some of the silk parallels are pretty tough to find and knowing that, I immediately jumped on this one when I saw it. I got it for $11.00, so I think I did pretty well. Ok, so this is the final post from my recap of what I got at today's card show. I got a bunch of Orioles PC needs. I got 8 cards that I didn't even bother showing (mainly because I was tired of scanning) and the three that I included in this post. 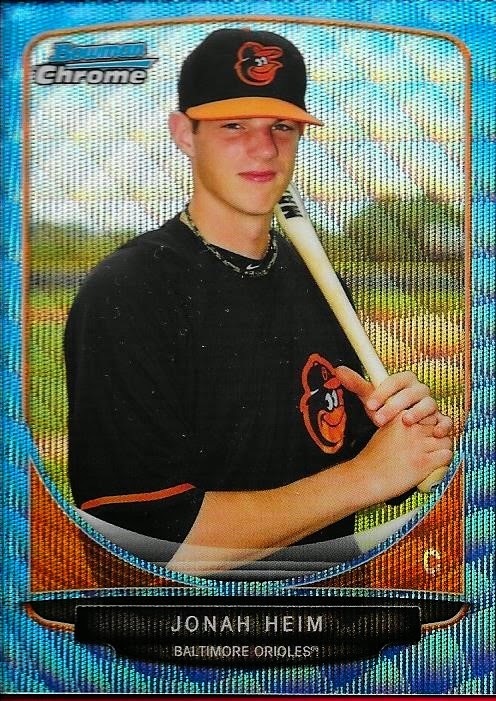 I really like this 2013 Bowman Blue Wave Refractor of Orioles prospect, Jonah Heim. The blue wave cards are amazingly beautiful and it helps that one of Heim's family members follows me on Twitter. I've picked up a few of Heim's cards and this one is my favorite so far. I found two of Manny Machado's Pro Debut cards. I used to see these go fairly high, but the 2011 I was able to get for $2. Not too bad. 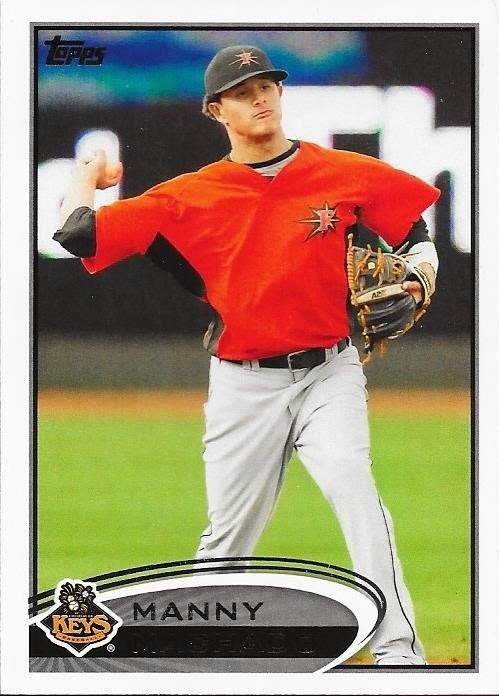 I got this 2012 Pro Debut for $2 as well, I think, but I'm beginning to lose track. 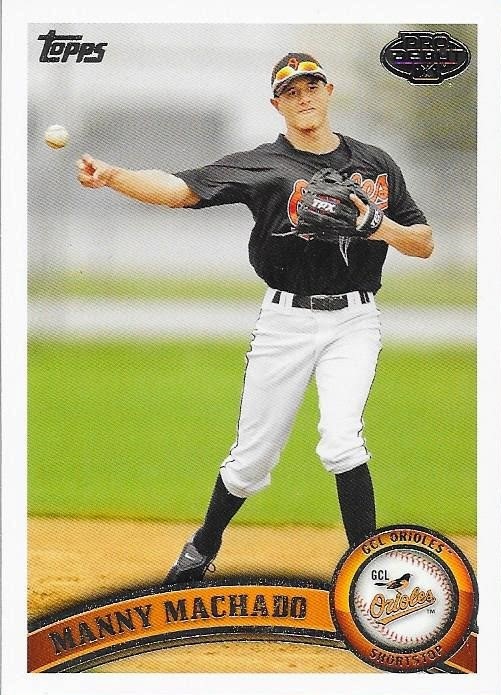 It still is a nice card and I always enjoy a good Frederick Keys card. 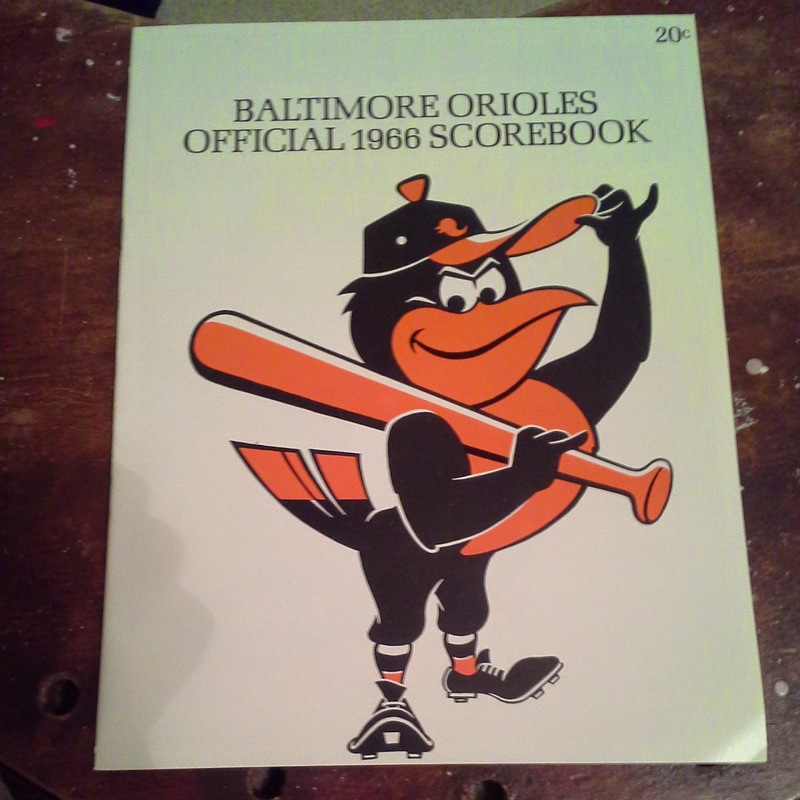 Finally, the last piece I'll show is this mint condition 1966 Orioles program/scorebook that I picked up for $10. I almost missed out on it, though. The guy saw me in my Orioles hat and Brooks Robinson shirt and brought the program to my attention right away. I only had a plastic shopping bag with me, so I didn't want to buy it right away and carry it around the whole time. I had the guy hold it for me while I made the rounds at the show. Finally, when I made the last bulk 1959 Topps transaction, I realized that I didn't leave myself with enough money to cover the program. Oops. Luckily, the world we live in now has smart phones where we can log onto the internet and pay someone via Paypal while you are standing there talking to them about cards. So, in a matter of minutes, I paid the guy electronically for the program and added on the previously mentioned 1959 Topps Yogi Berra. Well guys, there you have it. One of the most successful card shows I have been to in a long time. Yeah, I spent a good bit, but I made a huge dent in my 1959 set and scratched a bit of the surface on my 1969 set. Plus, I got a few sweet relic cards. Oh, I also bought cards for a few friends as well. I hope you all enjoyed these 5 posts. 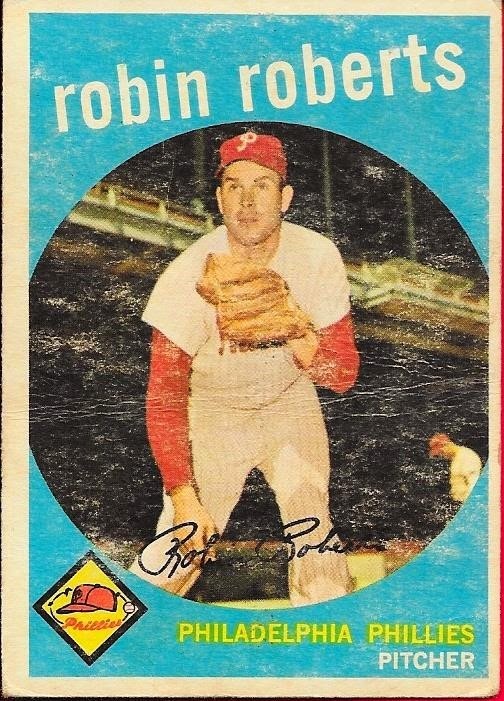 I got some amazing deals on some non-set needs, starting with this 1962 Topps Brooks Robinson All Star card that I have been needing for a long time. I'm a real big fan of the 1962 set. Some folks love it or hate it. I love it. 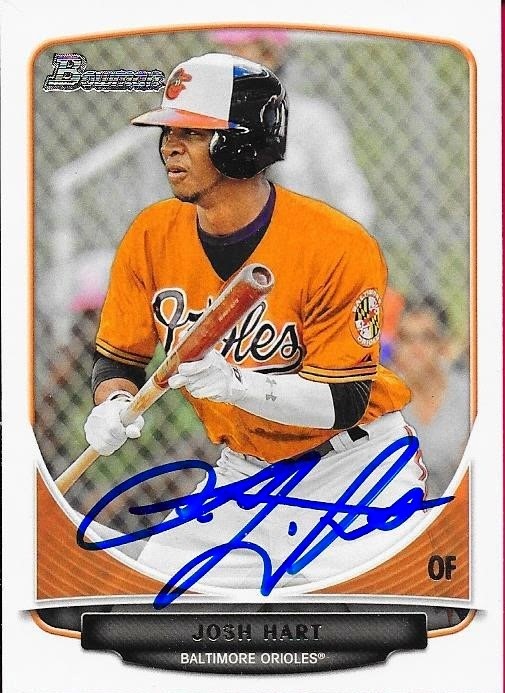 I wish Topps would do another "out there" border like this one or something other than white. That isn't too much to ask, is it? 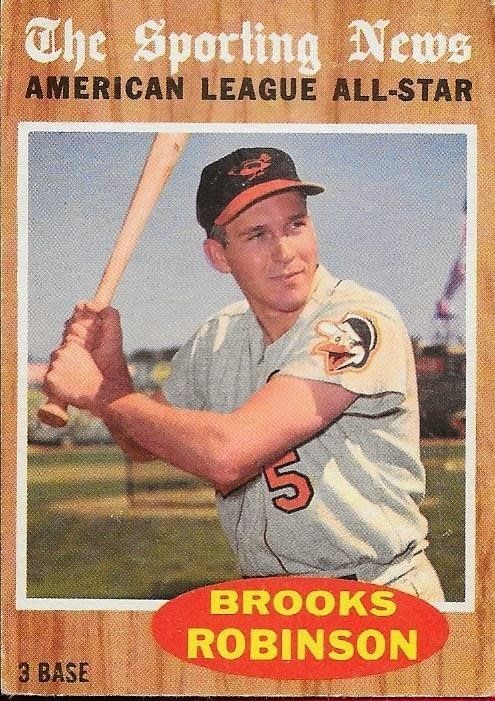 Also, check out the awesome Orioles patch on Brooks's sleeve. I want to find a patch card of one of those! 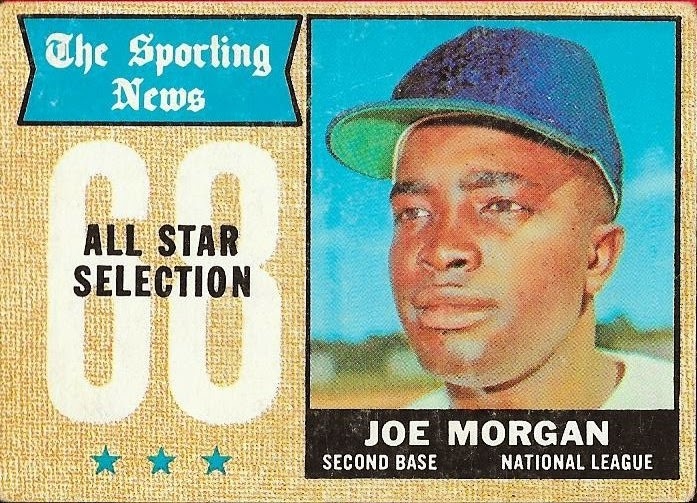 My Joe Morgan Topps PC is growing nicely. I picked up a few more of his cards (at $1 each, mind you) to add to the PC. Not bad, right? Check out the awesome shooting star Astros jersey. If I were an Astros fan, I would want one of these throwbacks for sure. I completed the 1970 set a while back and never noticed this jersey. It's pretty awesome, though, and I'm glad I noticed it finally. 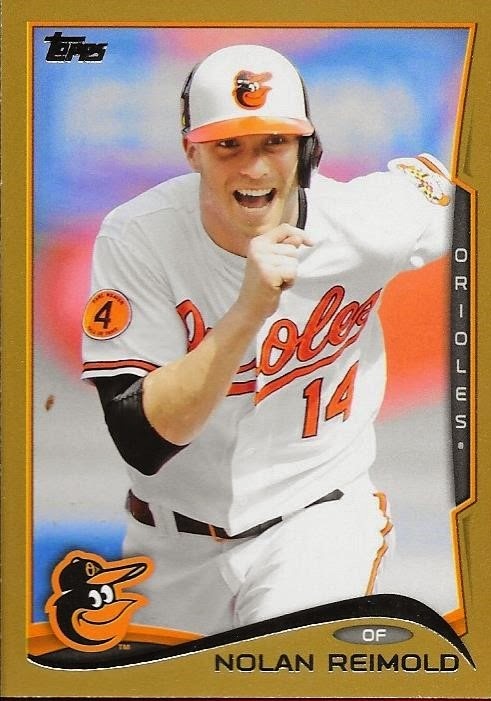 Ok, so, check back in a sec for the final installment from the card show where I show off my pickups of more recent Orioles. The bulk of what I picked up at the show today was a great deal of set needs for my 1959 Topps set. 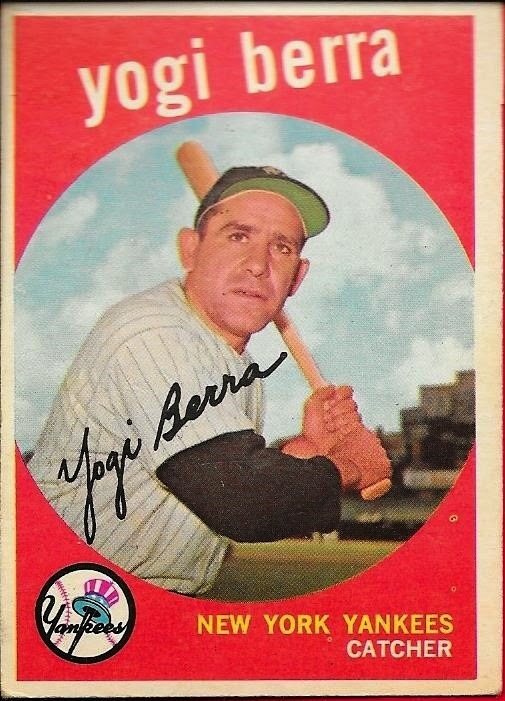 Check out this awesome Yogi Berra I got for $30. In all, I got 19 cards for my 1959 set. Most of them were in great shape. This Robin Roberts, for $3, was the roughest of the bunch. 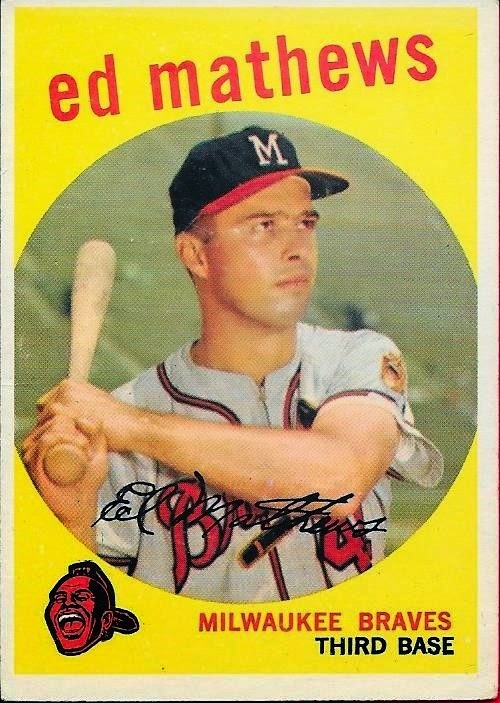 I got this Eddie Mathews for a steal at $15. Not too bad, I think. This Whitey Ford was probably the best looking of the bunch. I got this one in a bulk deal, so I don't know what the individual cost of it was. Much better than the $35 price tag, I assure you. 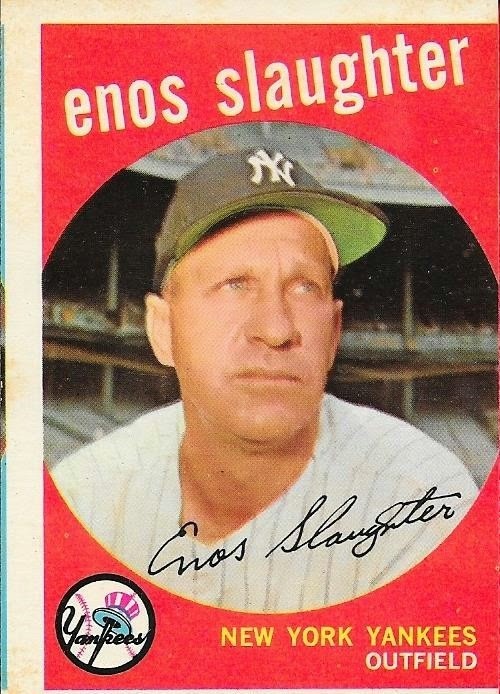 This Enos Slaughter isn't rough, but it sure is off center. I had a Larry Doby that was just as bad and I ended up upgrading it. I may do the same with this one, we'll see. 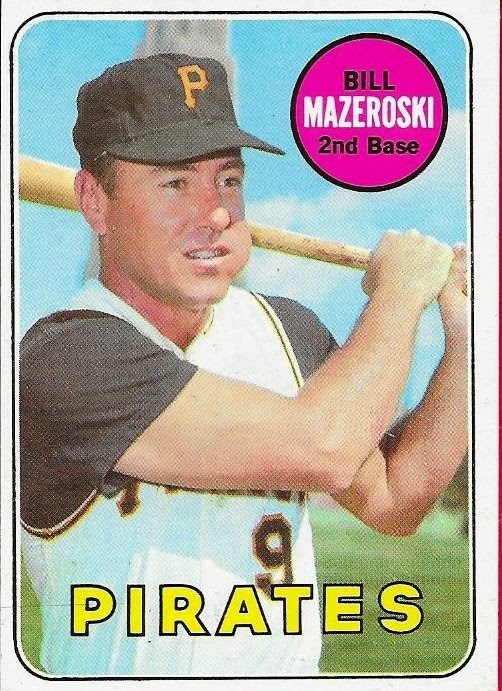 Hey, look, another Mazeroski. He seems like he was a common pickup today. I got a whole bunch of these group cards. I already had quite a few of them, and I feel like I knocked out most of the remaining ones. 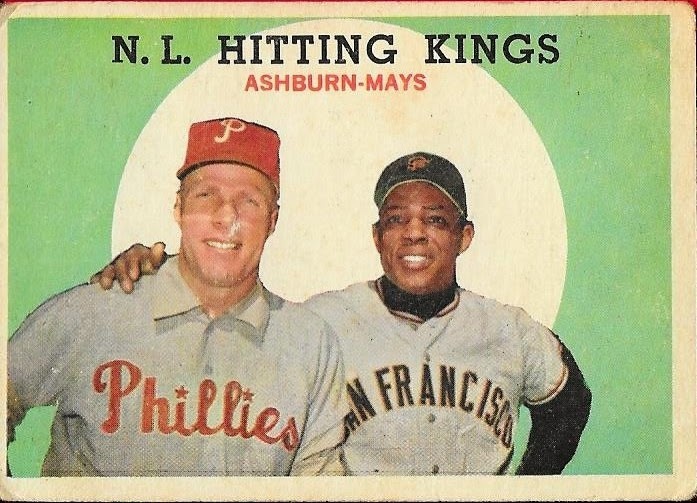 This Ashburn/Mays card might be the second roughest card in the bunch, but I got it dirt cheap and I'm ok with that. 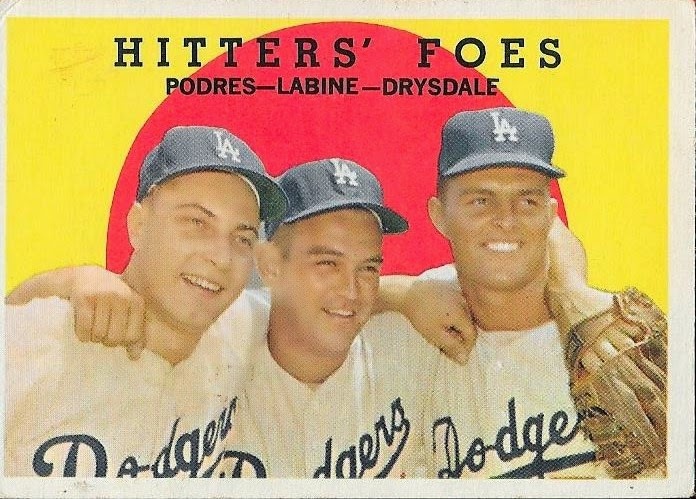 This Podres/Labine/Drysdale was the last card I picked up before I headed for the door. I had $4 left in my wallet and figured I might as well see what I can get for it. I saw this card for $6 and offered the guy $4 and he took the offer. I looked at a few of the team checklists today, but this was the only one I grabbed. The back is unmarked and the card looks really cool. The next two cards are more of the group cards, but the coloring on each really make them pop. 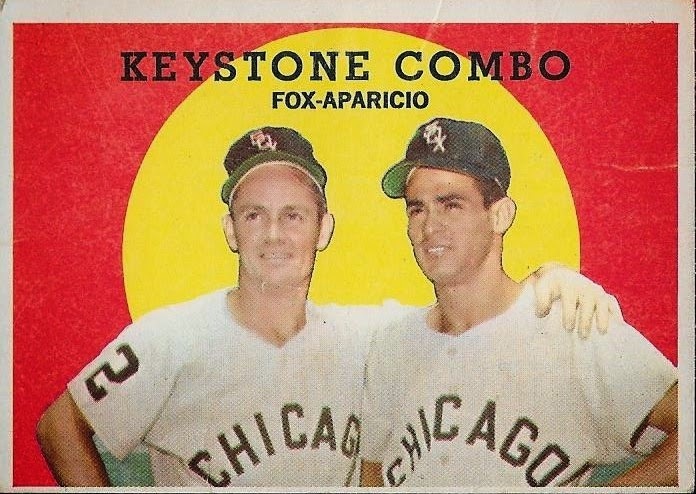 This Fox/Aparicio is a nice one of two Hall of Famers that I oftentimes forget about. 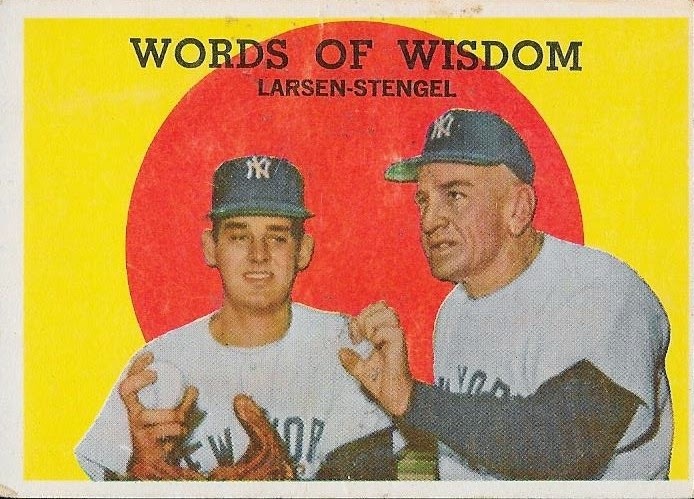 Stengel shows up in a few Topps regular issue sets quite a bit. This one of him discussing baseball with the legendary Don Larsen is pretty cool. Here we are with another old manager. 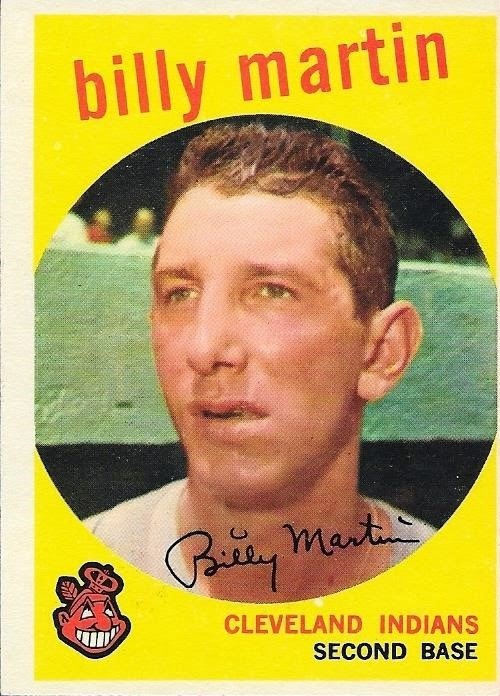 Billy Martin isn't in the Hall of Fame like the two guys I talked about in my previous post, but getting this card was really nice. Especially since his early cards carry a little bit of a premium. 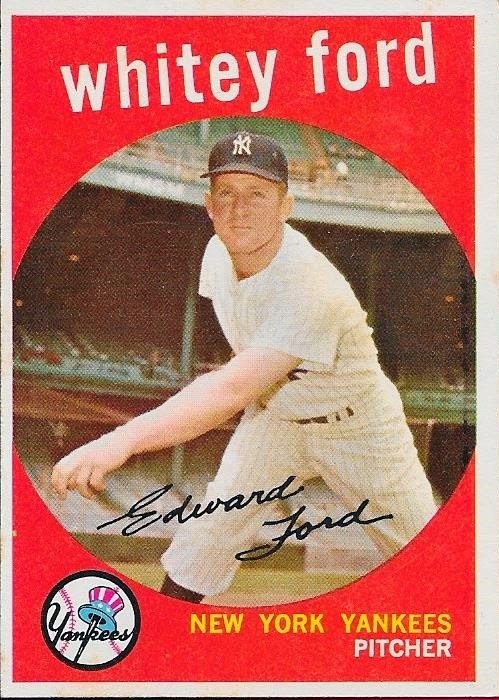 I honestly believe it is because of the name recognition in that he was the Yankees manager for a time (several times). Finally, the sole semi-star RC that I picked up. 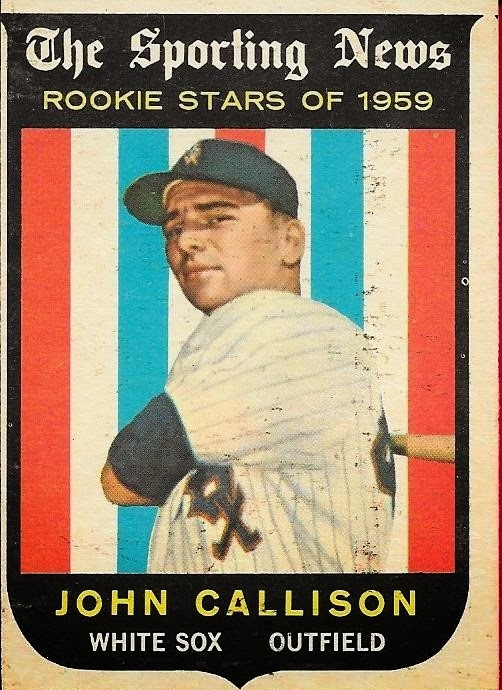 Johnny Callison was quite the second baseman in his day. I had heard Brian Roberts (pre-injury) compared to him in the past. I really like these RCs in 1959. So, there you go, those are all of my set needs pickups from the card show. My next post will be about my few vintage PC pickups. As promised, here is my next installment (Part 2, if you will), of what I got today at the Raleigh card show. I got such good deals on vintage set needs. 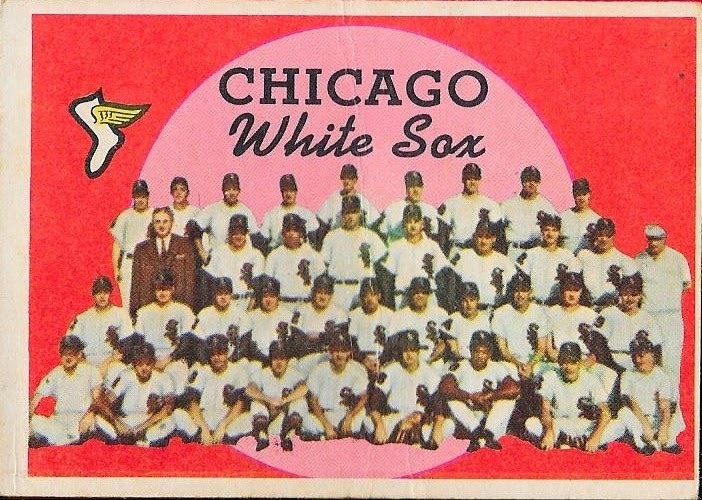 I added 7 1969s to my set, including 5 Hall of Famers, a checklist and a RC. 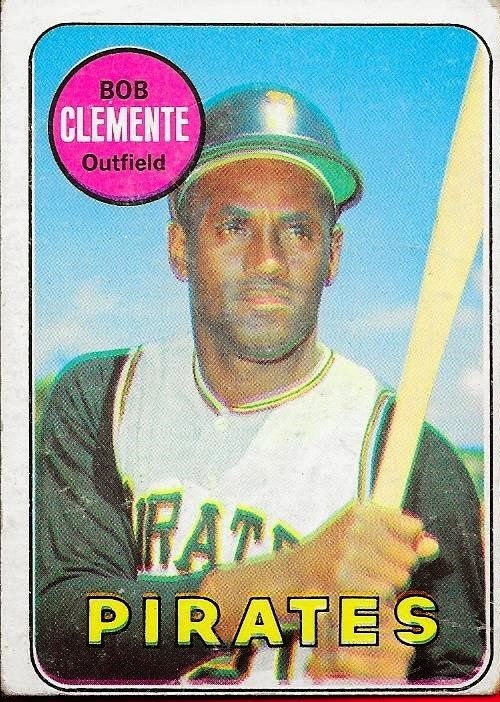 I made a rare double up purchase by picking up this Roberto Clemente that I already had in the set. The guy made me such a good deal on it, I couldn't pass it up. 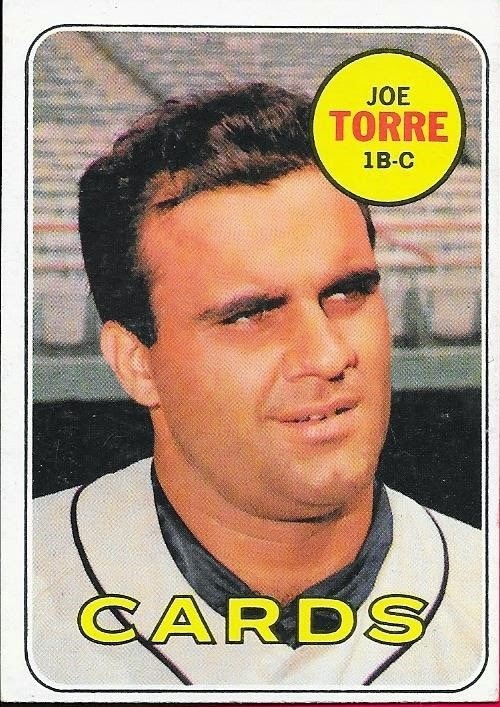 New Hall of Famer, Joe Torre is included in the lot of cards that I got. 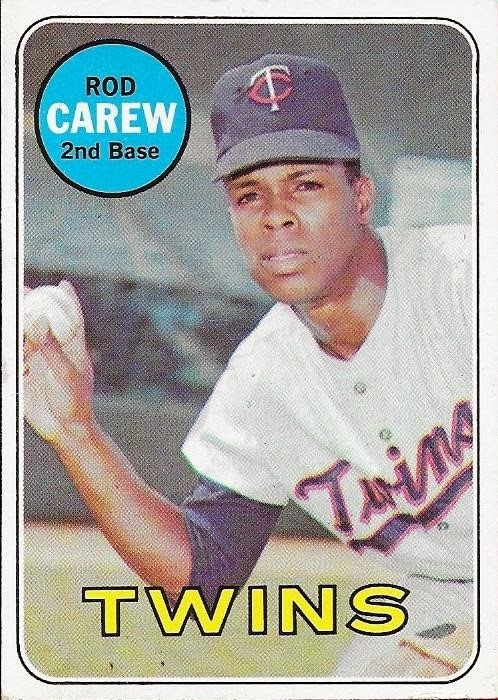 The 1969s I got were cheap for the most part, most around $1 a piece, but the below Rod Carew was much higher than that. Hooray for high numbers because this Carew carried a premium. Oh well, I would have bought it at some point, anyway, so why not now. This was one of the last purchases I made before I tapped out and went home, but I'm glad I got the card. 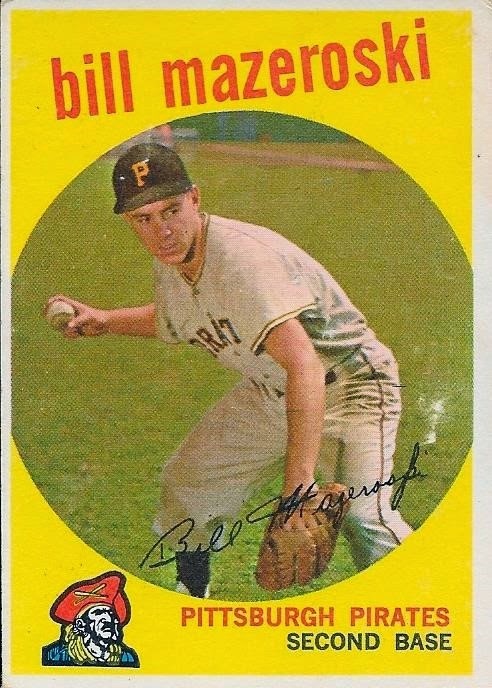 Can't forget Bill Mazeroski, even though most do forget he is a Hall of Famer. 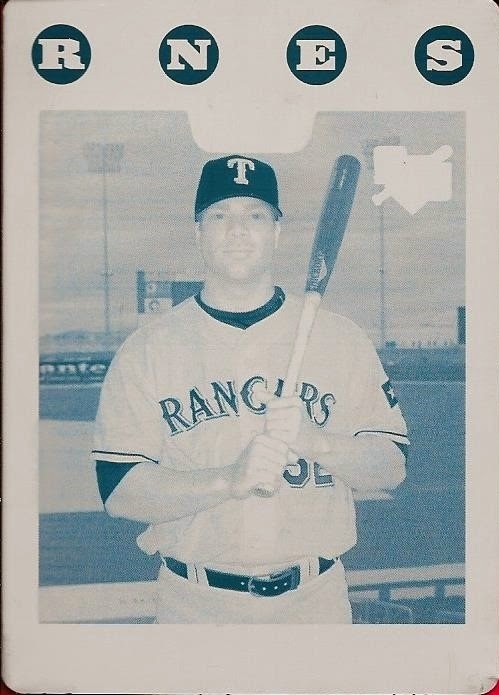 This is a really nice card of the former Pirate. 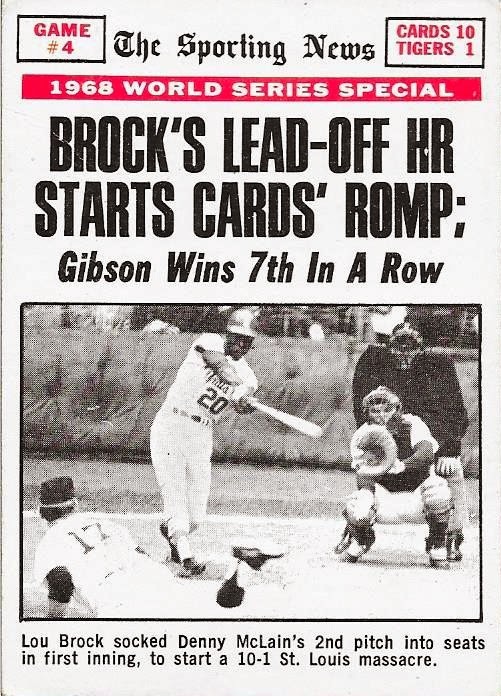 This was just about at the end of his Topps run as he had cards in 1970, 1971 and 1972 after this one. 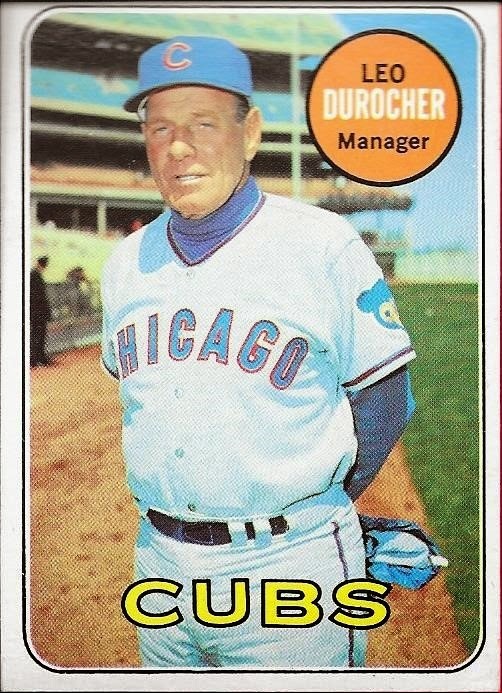 Finally, a Hall of Fame manager, Leo Durocher. Kind of funny seeing the Torre from above, a newly minted Hall of Fame manager and this card of thelegendary Leo Durocher. Kind of interesting seeing them close to each other. Kind of like a lineage or something. 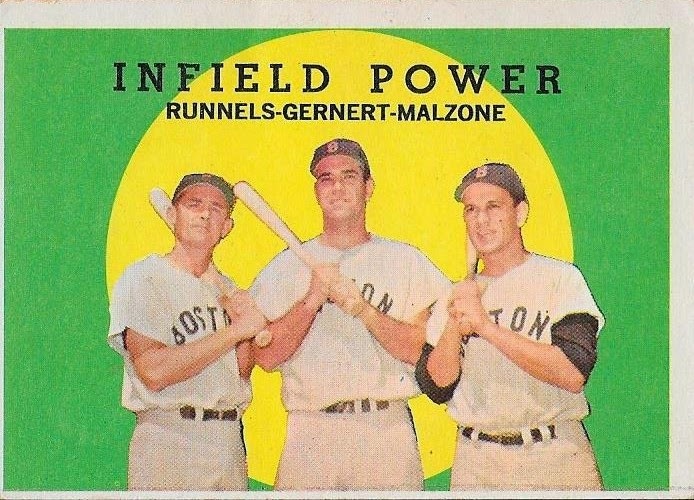 Stay tuned for my next installment, set to be written in a few minutes, my 1959 Topps pickups. Well, I blew my budget big time today at the Raleigh card show, but man, it felt good. It felt so good, I'm going to do something I haven't done in a long time on this blog, I am going to do a series of multiple posts, all today, showing off what I got. I hope you enjoy the ride, because I sure did. This was the first show that I have gone to completely by myself. Chris is with my parents for the week and my wife respectfully declined my invitation to go (saying "hell no" is respectfully declining, right?). I also checked on Instagram and texted a few of my card buddies to see if they wanted to go, and no one was available. This worked out well for me, since I didn't have anyone rushing me or asking to go home 5 minutes into the show. So, I was really able to look through stuff and find a lot of good deals. 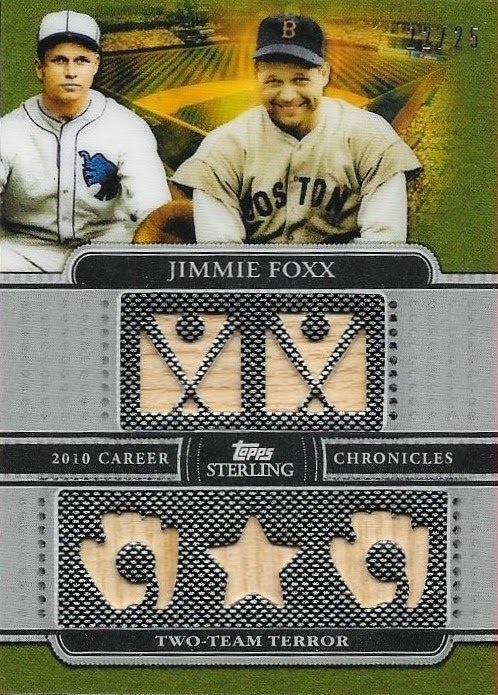 The above card is a 2010 Topps Sterling Jimmie Foxx multi-piece bat relic card. The was the single most expensive card that I bought at the show, at $50. I think it was a good price, though, and believe the card is amazing. It is numbered 22/25. 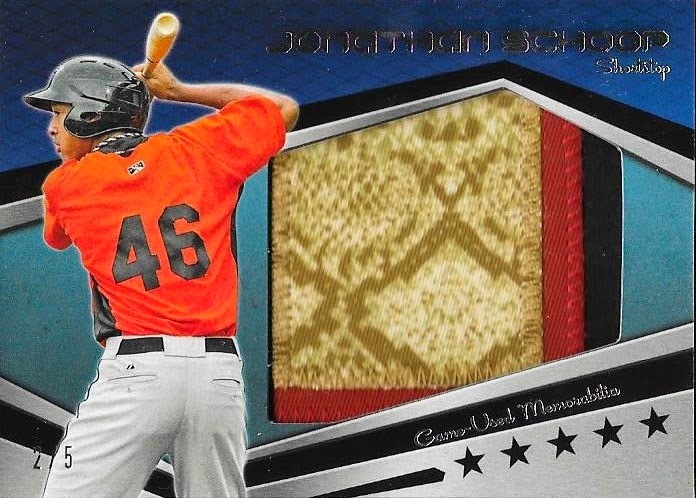 The best steal I got was this 2012 Topps Minor League Materials Jonathan Schoop patch card, numbered 2/5. Holy wow, it's an amazing patch. What's more amazing is that the guy only wanted $20 for it. Steal? I think so! What an amazing find. 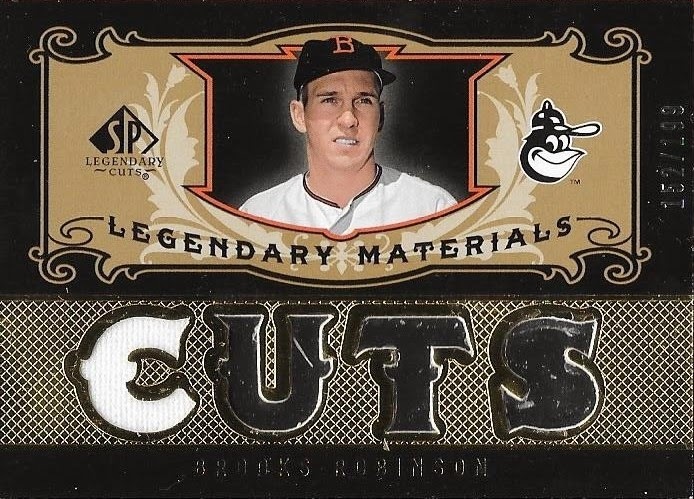 Rounding out my relic pickups, I got this 2007 UD SP Legendary Cuts Legendary Materials Brooks Robinson relic for $5. The card is numbered 152/199 and looks great. Stick around for part two, coming up in a few minutes. 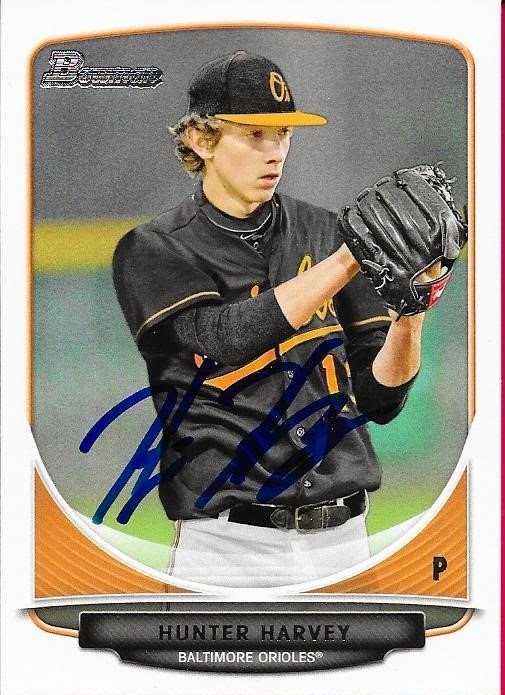 I posted the other day that I got an IP auto of Hunter Harvey in a surprise package from my buddy, Kyle. Before I knew Kyle was sending me his package, I had agreed to a deal with his best friend, Jordan, for a Harvey IP auto and a Josh Hart. Both boys went to the Delmarva Shorebirds game together and picked up the autos. Both cards look great and I really appreciate Jordan picking the autos for me. I've definitely met some awesome people on Instagram and it was really nice of Jordan and Kyle to think of me when they were at the game. I made a quick and easy deal on Instagram the other day with a kid named Ryan. 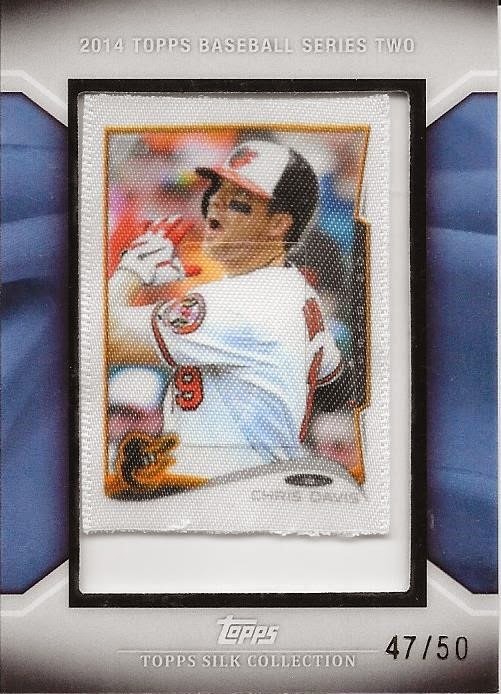 I saw that he had posted this 2008 Topps Chris Davis RC printing plate for sale for $40.00 shipped, so I had to jump on it. I think I had seen this several months ago on Ebay and let it slip away, so I wanted to make sure I didn't let that happen this time around. The plate is pretty cool, as all plates are. It is the Cyan plate. Thanks for the super easy deal, Ryan, I hope we can trade again! 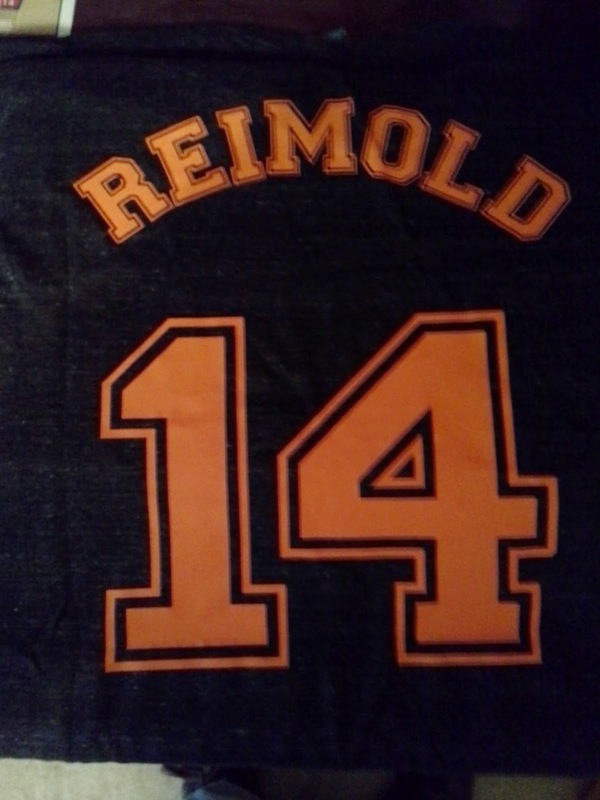 I got a package in the mail today from Jenny Reimold, She had told me it was coming, but I was still surprised. Jenny told me that because I have been so supportive of Nolan over the course of our friendship, she wanted to get me a little something as a thank you. She had ordered 22 of these shirts for friends and family of her and Nolan's and singled out 3 fans that she had been interacting with that she wanted to give shirts to as well. I made the cut! Nolan has recently begun a rehab assignment at AA Bowie after missing most of the last two seasons recovering from 2 spinal fusion surgeries. Nolan is sorely missed by many an Orioles fan and most of all, me. While I appreciate Jenny sending me this shirt as a 'thank you', no thanks were necessary. I consider myself very lucky that she and Nolan call me a friend. They are awesome people and I sincerely appreciate being able to talk with them. I know Nolan checks out my blog from time to time (Jenny checks it out all the time) and I have even gotten comments from Nolan's family members. 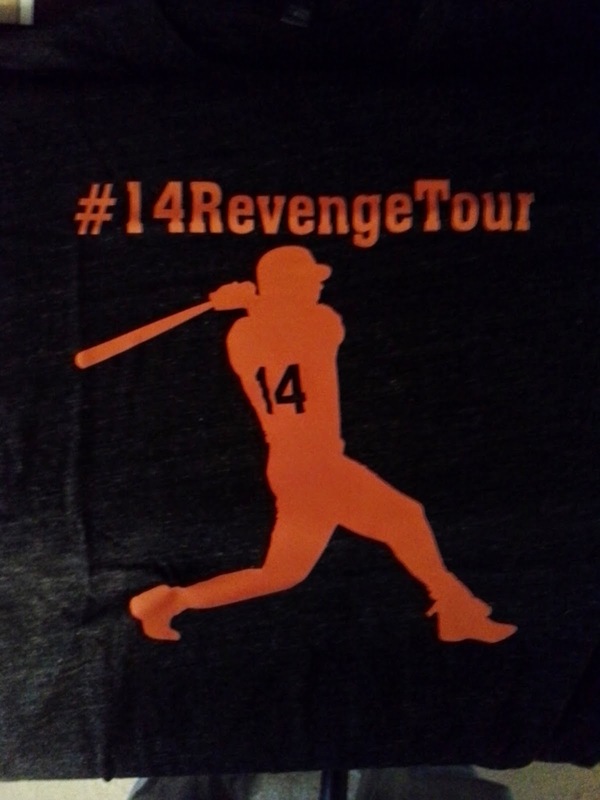 Thank you so much for the shirt, Jenny, I think it is awesome and I can't wait to put it on and celebrate the night Nolan comes back to the Orioles! I've been trading on Instagram for quite a while now and I always go back to the first successful transaction I completed on there as a template for how I believe things should be conducted. I bought a card off of Kyle, who has become a very good friend of mine, in an amazingly quick and easy deal. Since then, I talk to Kyle on a regular basis and he is very much one of my favorite people I have dealt with on Instagram. 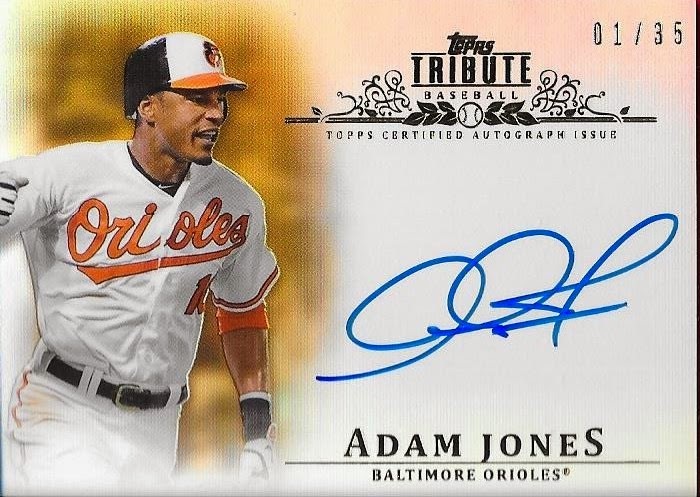 I got a surprise bubble mailer from Kyle yesterday that contained the above Adam Jones 2013 Topps Tribute auto. The card is beautiful. I was so surprised that Kyle sent it to me and am appreciative beyond words. 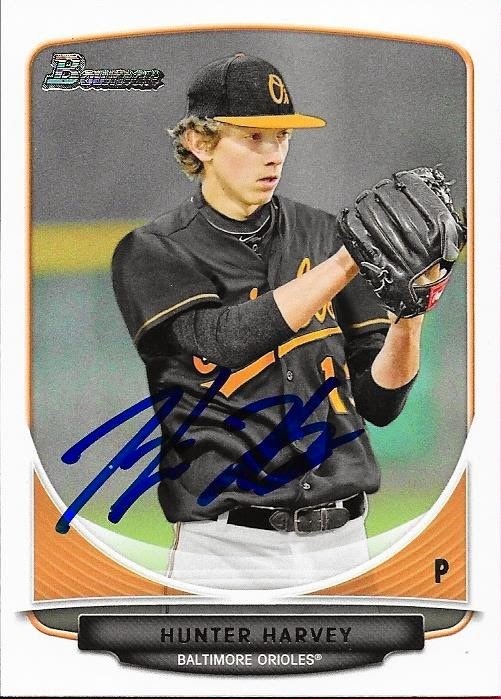 Not only did Kyle send the Jones, but he also sent me a Hunter Harvey autograph that he got in person at a Delmarva Shorebirds game with his best friend, Jordan. I had initially bought one of the IP autos Jordan got, but Kyle sent this one as well. Kyle is a great guy. who also posts on Youtube as MrPhilliesphan04. If you are active on Youtube, you definitely should subscribe to him. He's a big Phillies and Roy Halladay fan. Thanks so much for the package, Kyle, I really appreciate it!